A couple of the 90's giants, Joe Diffie, Aaron Tippin and Sammy Kershaw, joined forces and released an album together titled "All In The Same Boat". After two years of performing together, known as the "Roots & Boots Tour", the trio also decided to go to the the studio and record a CD of new material. The album consists of songs they cut together as well as solo songs. Aaron Tippin re-recorded his smash hit "Kiss This", while Sammy Kershaw re-cut "She Don't Know She's Beautiful". Joe Diffie brings all-new material. One of the highlights on the album is definitely Diffie's sweet reendition of Neil Young's "Heart Of Gold". The trio also made a funny video for the title song, which features their real wives. 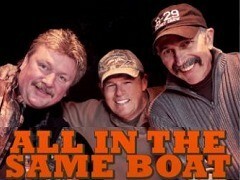 Joe Diffie, Aaron Tippin & Sammy Kershaw - "All In The Same Boat"